At the beginning of June 1996, the Magdeburg Student Days delighted students, staff members and guests for the first time – with a total of eight events since that time. 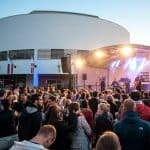 The summer night festival of the Sports Centre (SPOZ) of the Magdeburg universities, which is also popular these days, has become part of the Student Days. Since then, the Magdeburg Student Days with their parties, sporting events, concerts, theatre performances, exhibitions, readings and cabaret have been firmly inscribed into the cultural calendar of the city – and many events have become indispensable. The event marathon, traditionally during the first weeks of June, opens with the campus festival of the Magdeburg-Stendal University, the Beach Party has established itself as the biggest student party in Saxony-Anhalt, the Summer Night Festival as crowning conclusion has a history stretching back 20 great years. The programme between the three major events offers young local artists a platform and, besides learning, allows the students to show creativity, organizational skills and, above all, responsibility. Positive feedback can be heard beyond the campus boundaries and beyond the city creating enthusiasm amongst the regional audience.